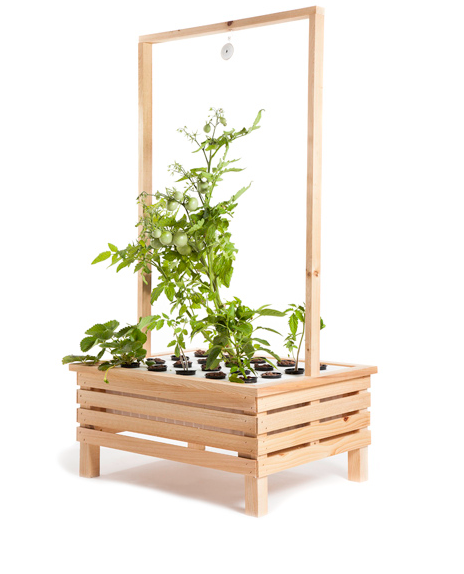 The Fizzy Farm Tall is a beautiful, healthy, simple to use, state-of-the-art hydroponic growing system. 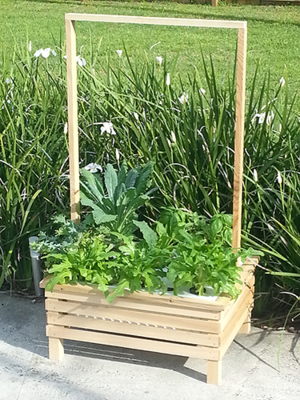 Designed to grow both vining non-vining fruits and vegetables – Tomato, Cucumber, Squash, Zuchini, Lettuce, Kale, Swiss Chard, Basil, Strawberries, Chives, Thyme ect. Turn your deck, balcony or indoor/outdoor area into a stunning garden. 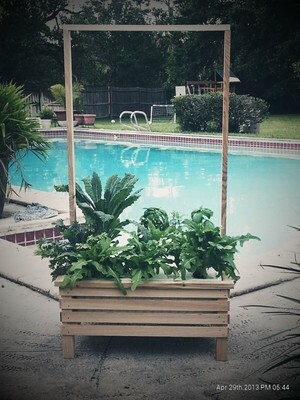 Trellis/Light Bar allows you to add light to grow inside year round. Either germinate seeds in one of our germination systems or simply buy plants starts from your local garden center. Add plants to the included net cups and grow. Change Nutrients every 2 weeks. 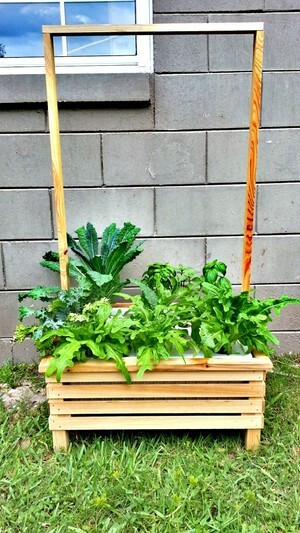 Anyone can grow beautiful and nutritious food right in your own backyard or balcony. 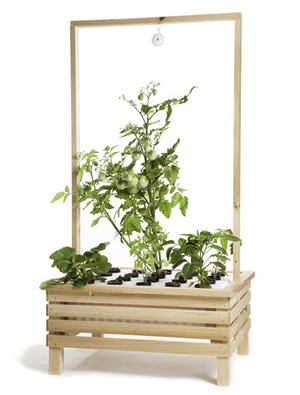 Grow vining plants like tomatoes or cucumbers outside on its built in Trellis. When it gets too cold, bring your Farm inside and hang your grow light on the Trellis and grow greens like lettuce, kale or herbs all winter long. The Fizzy Farm Is A Complete Deep Water Culture Hydroponic System That Is Ready To Grow The Moment You Plug It In. Only trust systems that are made from 100% food safe materials. No matter how you consume what you grow, your plants will absorb what is leached from unsafe materials. We only use food safe materials to build our systems. Our reservoir is constructed from Polypropylene (PP) and the grow top is 100% food safe High-Density Polyethylene (HDPE). One of the things that set the Fizzy Farm apart from all other growing systems is our venturi pump that creates fast moving and highly oxygenated nutrient. Most deep water culture systems oxygenate their systems using some variation of a bubble stone. “In classical hydroponics, a boundary layer develops around the active absorbing regions of the root, modifying apparent uptake kinetics of even the most mobile ions (Weathers and Zobel, 1992). 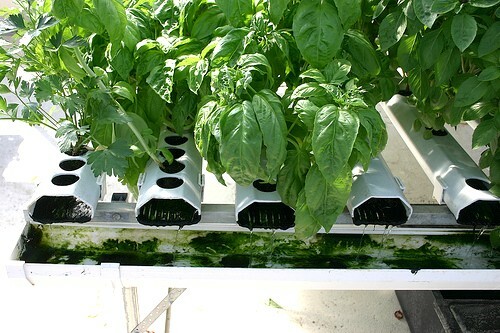 Hydroponics with vigorous aeration, thin ﬁlm (nutrient ﬁlm technique, NFT) hydroponics and aeroponics, obviate this problem, giving the root immediate access to even the least mobile ions.” It’s this boundary layer that fast moving nutrient overcomes. The results are dramatic. The picture on the right is of two Thai Basil Plants. The top one was grown in the Fizzy Farm and the bottom one was grown in a simple bubbler. The research above on early root growth is from a white paper written by Hillel Soffer’ and David W. Burger for the Department of Environmental Horticulture, University of California, Davis called “Effects of Dissolved Oxygen Concentrations in Aero-hydroponics on the Formation and Growth of Adventitious Roots”.